Family learning vacations are our specialty with our low cost packages, family discounts, great homestay families and a small non touristy town. Young students will have a chance for an unforgettable vacation! Our classes are almost always one on one for the adults with children take classes together based on same language levels. This makes us a great place for an alternative learning atmosphere where the small town mentality will allow your children to get back to basics and see the world in a different light while you make language improvements as well! Your dedication as a family to Language immersion being playing soccer on the street or practicing in the local supermarket is the key to get the full benefits of the classes. The children’s classes are very active with games, arts and crafts, local walks and learning trips, puppet making and play dough all while absorbing and learning the new language. Our Spanish School Costa Rica is located 5 minute walk from our hotels and max 10 minute walk from homestay family houses making getting around easy with no extras costs of taxis and buses to get to classes each day. We have our own children’s play room including a dress-up box etc. to facilitate learning. We always suggest to have the younger students in separate classes from adults as it really helps the learning immersion. Children’s classes would be set up to have in classroom time including, depending upon age, painting, puppets, play dough making etc. to bring vocabulary and new language into use. The teacher will then include short walks around town to alleviate in classroom time and to help with general conversation. All accommodation options are available but staying with a family is a definite must for full immersion. We do our best to find a homestay family with children close to the same age as your children as this is the incentive to the student’s integration. Please remember that no child is alike especially with foreign language skills. A child’s ability to learn a foreign language is based on actual learning skills in their Parent language. 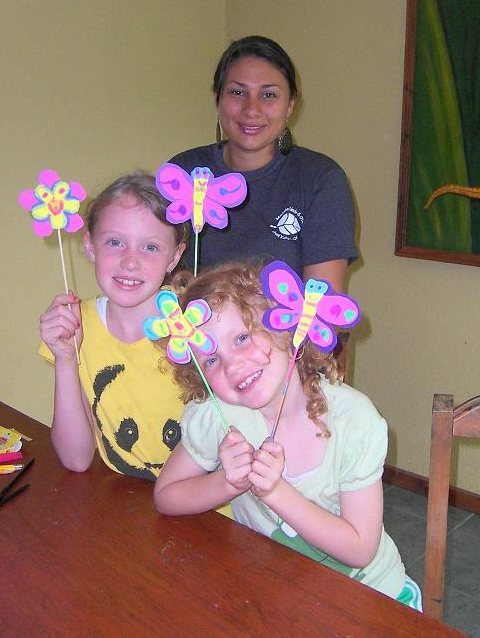 Children’s classes at Montaña Linda Spanish school Costa Rica will be based on: Current knowledge of the Spanish language in both oral and written comprehension and classes will then be adapted to fit skills of the child while incorporating Parent’s goals for their study vacation. Children travelling alone must be at least 18 years of age. Children and family discounts available. Homestay family use and family discounts are ONLY applicable when at least 1 adult is taking Spanish classes.